If you have (or someone you know has) suffered some form of irreversible sight loss, you may have noticed that your spectacles have become less effective. In some cases, we are unable to improve your vision with a new spectacle prescription. However, just because glasses are no longer of benefit, it doesn’t mean there aren’t any other options available to you. At Evans & Hughes we’re committed to helping our patients make the most of their remaining vision. It’s for that reason that most of our opticians are accredited to offer a low vision service, whereby they can assess an individual’s need before providing them with the best suited product. We liaise with a number of other professionals involved with the rehabilitation of people who have suffered vision loss, including social services and mobility officers. That way we can get to know our patients really well before providing them with the low vision aids that will help them most. 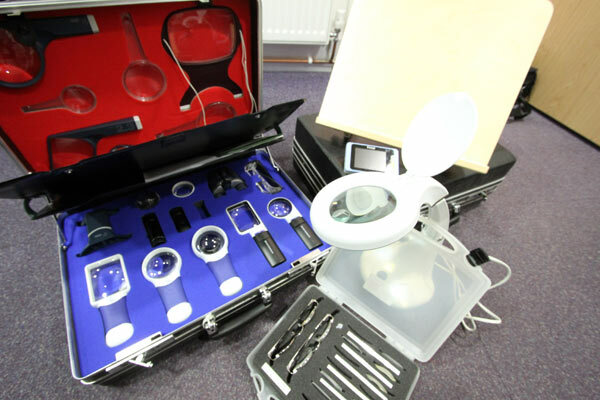 Some of the low vision aids we’re able to give our patients include hand-held magnifiers, electronic magnifiers and lamps to improve lighting quality when reading. These appliances are given free on loan for as long as they are required. Please note : If you or someone you know requires advice or support regarding vision loss, our friendly team will be more than happy to put you in touch with the relevant services and support groups.